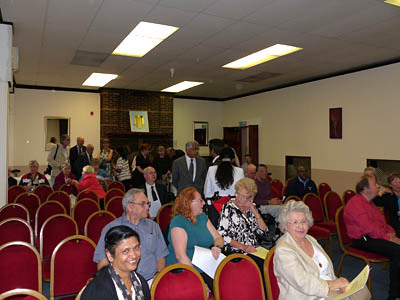 This event was held at the Harrow District Masonic Centre in Northwick Circle, Kenton, Harrow, Middlesex on Wednesday 24th June 2015. 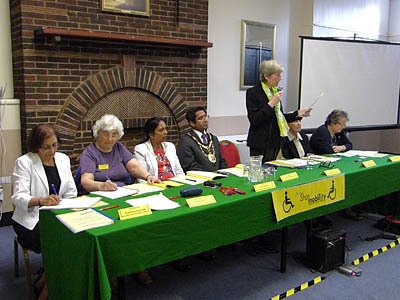 The AGM was chaired by the Mayor of Harrow, and it was a celebration to recognise all those who made it possible for us to be where we are today. 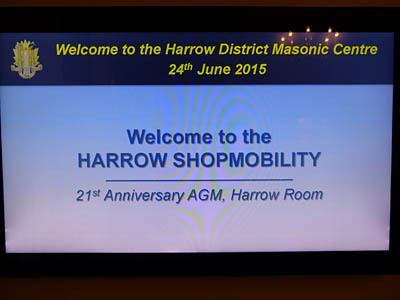 We would like to thank the Harrow District Masonic Centre for kindly sponsoring the venue for our 21st Anniversary AGM. 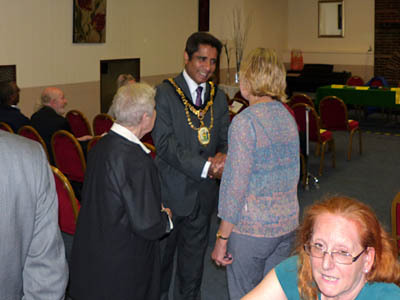 The Worshipful The Mayor of the London Borough of Harrow Cllr. 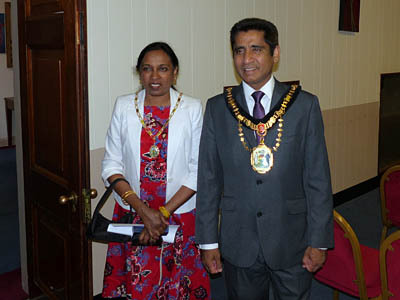 Krishna Suresh and Mayoress Sasikala Suresh. 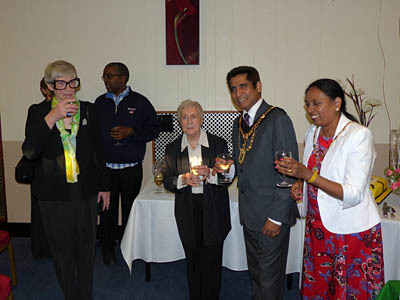 The Mayor with Committee member, Helen Dashwood and Pushpa Hargovan. 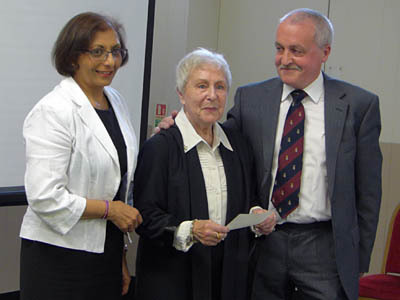 In the background, Chairman of Harrow District Masonic Centre, Mr. Sanjiv Shah and Mrs. Ann Scotter, Vice President Harrow Shopmobility, with Volunteer Chris. 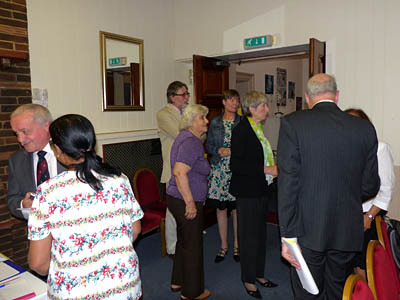 Guests arriving: Mr and Mrs Allan Pulford, Cllr James Bond, being greeted by Chairman Mrs. Eileen Kinnear and Vice President Mrs Ann Scotter. 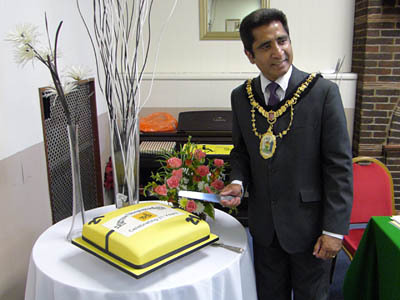 Mayor of Harrow, Cllr. 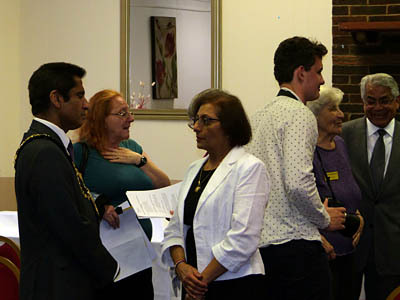 Krishna Suresh, meeting long term volunteer Mrs Jill van Dyken, Helen Dashwood (committee member) and Mr. John Alwright (background). 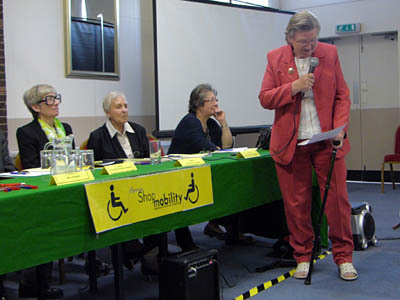 Guests arriving: Mrs Patricia Osborne (in wheelchair), Mr Bryan Searle of the Weir Archer Academy (guest speaker). 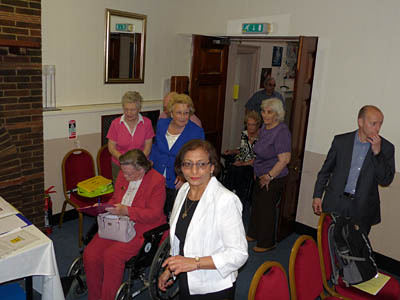 Some of the guests including Mrs Bobbie Feakins, widow of former Mayor. 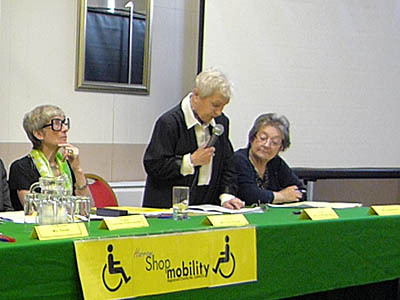 The Chair, Eileen Kinnear, delivering the annual report. Mrs Gaye Branche, Treasurer, presenting the financial report. 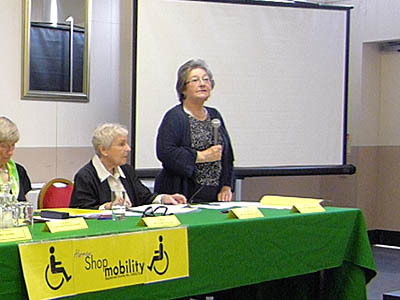 President and Founder of Harrow Shopmobility, Mrs Vera Murray Fowler, talking on the contribution of volunteers in her address. 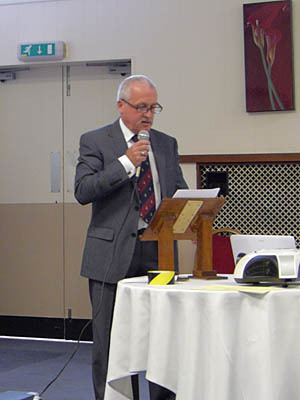 Alan Pulford, Treasurer of Middlesex Grand Family Fete, talking on the charitable role of the MGFF. 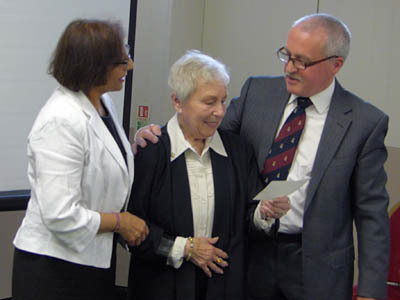 Mr. Pulford presenting a donation from MGFF to Harrow Shopmobility's Mrs. Vera Murray Fowler. 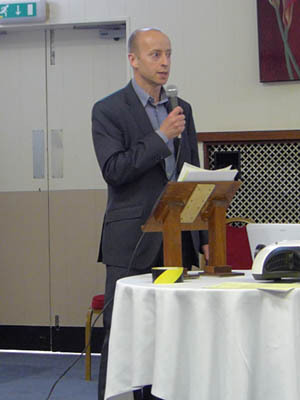 Mr. Bryan Searle talking about his charity "Weir Archer Academy". 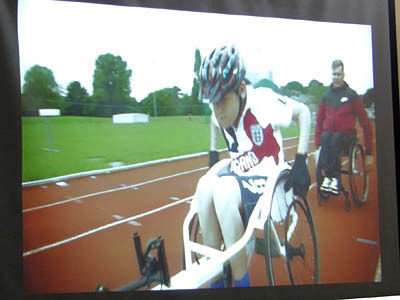 The charity was founded by David Weir (Gold Medalist Paralympian), and Mrs Jenni Archer (his olympic coach). 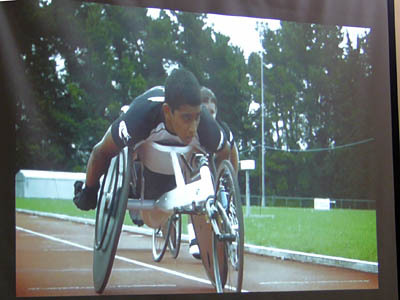 The charity promotes sports amongst young disabled people. 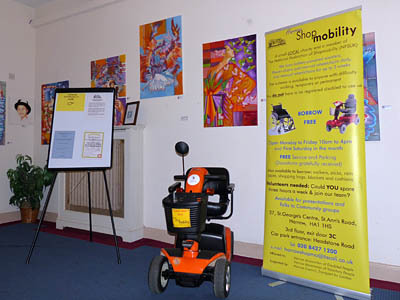 Harrow Shopmobility's longest registered member, since 1994, Mrs Patricia Osborne, giving a proud thanks. 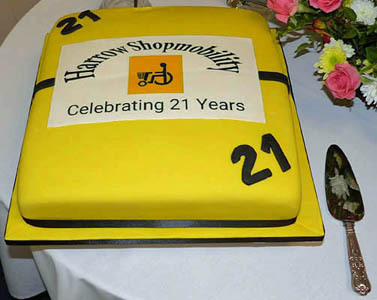 The 21st Anniversary celebration cake. 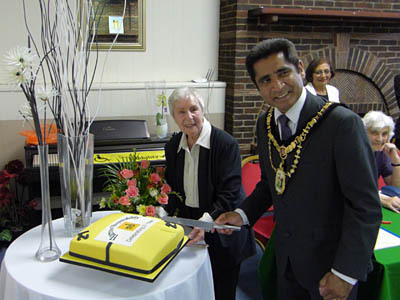 The Mayor cutting the cake. 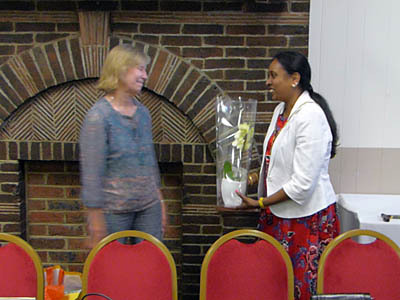 Jill van Dyken presenting flowers to Mayoress Mrs Suresh. 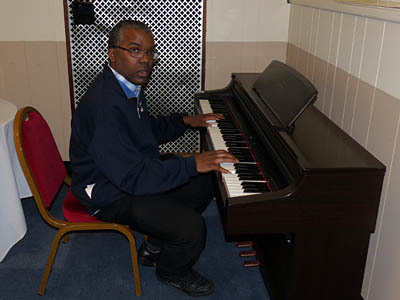 Volunteer Leon Edwards providing a musical interlude.